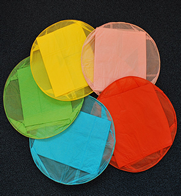 Eco Friendly 100% Mixed colours - Biodegradable and Metal Free Sky Lanterns. Metal Free Environmentally Friendly Sky Lanterns which contain no metal parts and are 100% biodegradable - Light up the sky without littering the ground. Our Environmentally Friendly Flying Lanterns are perfect for weddings, parties or family get togethers. They're also easy to use - just light the fuel block and watch the lanterns as they soar into the sky and disappear into the distance giving a beautiful display. What's the environmental impact of a Sky Lantern? There has been some recent press coverage on the environmental impact of flying lanterns. Unfortunately, many sky lanterns are not biogradable and use metal wires which make them dangerous to animals and cause an eyesore when they come back down to the ground. 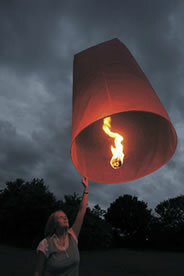 We are pleased that our Sky Lanterns do not use metal parts or wires. They are also 100% biodegradeable. In conjunction when developing this new Sky Lantern, we developed a new 'attached' fuel cell. This simplifies lighting and reduces the time from lighting to flight. This design element combined with the flame retardant paper makes our Eco Lanterns the safest Sky Lanterns available on the market today. How the lanterns are packed? The lanterns are delivered 'flat-packed' in packs of 5. The dimensions of a pack of 5 are 39cm x 39cm x 3cm. Our Flying Lantersare are dispatched within one working day of receiving payment by Courier. Delivery takes 2-3 days. They are packaged in sturdy recycled cardboard so will arrive in the best condition to your door. What if the Sky Lanterns don't arrive? We use a reputable courier with tracking details. In the rare event of your sky lanterns not arriving, we will refund you in full after 7 days of postage. Our Sky Lanterns are securely wrapped in recycled cardboard in order to prevent any damage to the contents. Sky lanterns are airborne paper lanterns traditionally found in some Asian cultures.